Alderney is one of the Channel Islands, administratively part of the Bailiwick of Guernsey. There are no cities on Alderney. The island itself is only 3 miles long by 1.5 wide. The main concentration of houses and shops is in the centre of the Island in the town of St Anne - often referred to simply as 'Town'. The Parish of St Anne's includes the whole of the Island. Although the Auregniais (Alderney Norman-French) language eventually died out in the early part of the 20th century, place names are often in French, which points to its close historical association with Normandy, France. The parish of St Anne is served by a magnificent, cathedral-like parish church in the centre of Town. Like the other islands Alderney is a self-governing Crown Dependency. It has its own parliament, the 10 member States of Alderney which sits 10 times a year. Alderney is also part of the Bailiwick of Guernsey which in modern terms is effectively a customs union including Guernsey and Sark (but not Jersey). In addition, because of an agreement made between Alderney, the UK and Guernsey after the Second World War, Guernsey takes responsibility for providing a number of public services on Alderney (e.g. health, education, the airport etc). These 'transferred services' as they are known, are provided by Guernsey in return for the right to collect direct and indirect taxes in Alderney at the same rate as in Guernsey. Due to its location in the English Channel and its proximity to the French port of Cherbourg, it has often been seen to be strategically important, despite the treacherous waters that surround it. In the 19th century, a large breakwater - the longest in the UK - was built at Braye in order to form a harbour sheltered from the Swinge tidal race. Although it was never completed, its spectacular remains form the modern harbour. During World War II the island was occupied by German forces, including the SS, and four forced labour camps were built. Although not an extermination camp in the same sense as e.g. Dachau and Buchenwald, very many forced labourers, particularly from Eastern Europe, were worked to death, and there is a memorial to them near to Saye (pronounced 'Soy') which is a must-see. Alderney was where T.H. White, best known today for his Arthurian tetraology, The Once and Future King, settled for the final years of his life, after spending much of World War II in western Ireland. He ended up buying a house at 5 Connaught Square. Visitors who wish to learn more, may want to read T.H. White: A Biography, Sylvia Townsend Warner (1967). The uninhabited islet of Burhou, off the northwest end of the island, is an important nesting area for seabirds. The former farmer's cottage on Burhou can be rented from the Government, and is used for 'get away from it all' holidays by a number of Alderney residents. To the south of the islands, separating Alderney from the Cherbourg peninsula, is the Alderney Race (Raz), notorious for is extremely strong currents and rough seas. Despite the hazards presented by Alderney's rocky coastline and the hazards of the Swinge and Race, Braye harbour is a popular destination for yachtsmen and in summer the harbour is full of boats of all kinds, from small RIBs to multi-million pound luxury yachts. 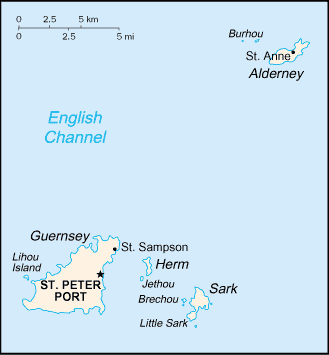 Alderney's sole official, and most predominant, language is English. The local dialect is virtually identical to the English spoken in England and on the rest of the Channel Islands, with a few terms for local items (for example vraic - seaweed fertiliser) being borrowed from French and the now-extinct Auregnais. Local placenames are pronounced in the 'Norman' style, for example Dupont is pronounced 'dip-oh'. Despite the fact that the island lies only a few miles off the coast of France, the French language is not widespread on Alderney, having ceased to be an official language in 1966. Nevertheless, most of the local place-names are in French or Auregnais, as are many local surnames and street names. Some road signs are bilingual in English and French, including those around the airport and those pointing towards Town, as to assist French tourists and yachtspeople. As of January 2011, there are daily flights from Southampton (with Aurigny Air Services There are also daily flights from Guernsey. Manche-Iles Express operate summer ferry services from Dielette in France and Guernsey to Alderney. Alderney is a small island, and in good weather, there's really nowhere that isn't within walking distance. Bicycles and cars can also be hired. During August, there is a regular bus service round the island and even a railway service between Braye and the north of the island. If hiring a car, remember that traffic on Alderney moves on the left. The national speed limit is 35 miles an hour, although this can drop to 15 in some areas. There is a nice range of restaurants, from cafes to smart top notch food. There are no "chains" of fast food, no McDonalds, no Burger King, Pizza Hut etc. Everything is locally owned. Alderney's reputation as "2000 alcoholics clinging to a rock" is well warranted. At points, it has had a higher pub-to-person ratio than any other settlement in the United Kingdom. Alderney is probably one of the safest destinations you can visit. Crime is rare and often fairly minor. People generally leave doors unlocked and often leave vehicles unsecured with the keys in the ignition. However, do not emulate the locals in this regard. Every summer, the police remind people to lock cars and remove their keys for that reason. Unlike the UK, which has liberalised its drinking laws, Alderney observes strict licensing hours, which, although formerly the longest in the British Isles, are now probably the shortest. In the winter, no alcohol may be served after midnight, and all premises must close by 12:30. In the summer, these hours are extended by half-an-hour. Alderney, like the UK, Ireland, Jersey and Guernsey, has now banned smoking in public places. Alderney has many historical features which can be visited. The island's Museumis a good place to visit to find out about the local history before heading off to explore the island. The Nunnery at the Eastern end of the island is a former Roman Fort and well worth a visit. Many former German bunkers and structures can be explored as well as the Victorian Fort Tourgis. This page was last edited on 20 June 2018, at 14:49.